Soap by Red Antler Apothecary. I’ve become obsessed with their root beer soap. It smells exactly like the drink, and puts me in a good mood whenever I use it. It’s cheerful and happy, and who couldn’t use something like that to start their day? Books. Of course books make the best gifts! (You were thinking I’d say something else? Come on — this is a writer’s blog.) This year, for your dystopian-obsessed teen, check out The Winner’s Curse by Marie Rutkoski. First in a trilogy, it’s the smart, fast-paced story of star-crossed lovers from opposite sides of a war. For your middle-schooler, I can’t say enough good things about David Barry’s The Worse Class Trip Ever and The Worst Night Ever. They are hysterically funny and at the same time absolutely gripping. Finally, for the adult thriller junkie, consider Go-Between by Lisa Brackmann. (Admission — this is the sequel to Getaway, which I have not read but have heard very good things about. You are probably better off starting there.) It’s an intelligent and all-too-realistic look at for-profit prisons, drug laws, and politics, with plenty of suspense to keep you turning pages and a tough talking female protagonist who may just have you believing in conspiracy theories by the end of the story. Photo by the awesome Kevin Harkins. We had snow today. And a Christmas concert. And did I mention poison ivy? (That would be me.) And I have finished an entire draft of my novel and am now laboriously working my way through revisions. (Shhhh. Don’t tell anyone.) Which all goes to explain why this post is late. And also, why it is probably the last one of the year, because around the holidays, the days are just packed. But, if you are like me, you might be able to use some gift ideas right about now. I of course have some EXCELLENT suggestions, most of which involve books. Ready? I had an early Christmas this year — I purchased Alice Hoffman’s Survival Lessons and Joshilyn Jackson’s Someone Else’s Love Story. Completely different books, both beautifully written. For that hard-to-please person, for the person who has had a tough year, or just for yourself, buy these books. I promise they will not disappoint. Have a teen who tore through the Diversity and Hunger Games books? Try the Wake series by Lisa McMann. Spooky and tightly written, they’re impossible to put down. Tired of the Wimpy Kid and Big Nate series? Get your reader to branch out with the Dragonbreath series by Ursula Vernon, or Doctor Proctor’s Fart Powder (Joe Nesbo, and worth it for the title alone). Or for a stretch, have them try the False Prince by Jennifer Nielsen. The Hero’s Guide to Saving Your Kingdom by Christopher Healy is also quite popular around here. What would I like to find under my tree? I’m intrigued by Parallel Lives: Five Victorian Marriages by Phyllis Rose; Chasing Alaska: A Portrait of the Last Frontier Then and Now by C.B. 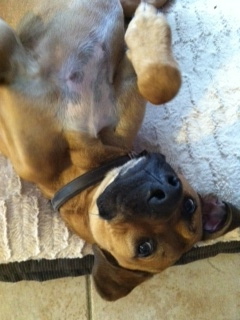 Bernard; and A Story Lately Told by Anjelica Huston. What do you hope to find under your tree this year? There are lots of things I keep meaning to do lately, but never seem to get around to actually doing. That’s particularly true when it comes to my writing community. It seems there’s always something else more pressing (deadlines, soccer games, homework help, actual sleep) or that requires the same financial resources (again, soccer fees, dance classes, dog kibble). But supporting other writers — and finding that kind of support for myself — is so essential. Before my novel was published, it was amazing to connect with other writers who were struggling to create the best story they could, to find an agent and then a publisher. And getting to know those writers, watching them launch their own novels out into the world, has been a wonderful experience. It’s also been pretty cool to get to know some people who have been down this path before me, some of whom I’ve admired for years. Renew my membership at Grub Street. I constantly tell people about this fabulous writing resource in Boston, but somehow I’ve let my own dues slip. Whoops! Join the Women’s Fiction Writers Association. This is a new group I’ve been eyeing and meaning to join for a while, but haven’t found the time. Purchase/preorder several books by authors I know. (If you are interested in which ones, I’ve linked to and mentioned them on my FB author page recently.) They are all great authors at different stages of their careers, and I want to make sure they all have the chance to keep writing. (Oh, heck. You’re not going to click, are you? Fine. I’ll make it easy. Is your money aligned with your mouth these days? Tell me how, please. We have lots of bookcases in our house, and they all have their own purpose. The bookcase in the basement, for example, holds the baby books my kids enjoyed looking at when they were toddlers. (They’ve been chewed and drooled on and I still can’t bear to part with them.) 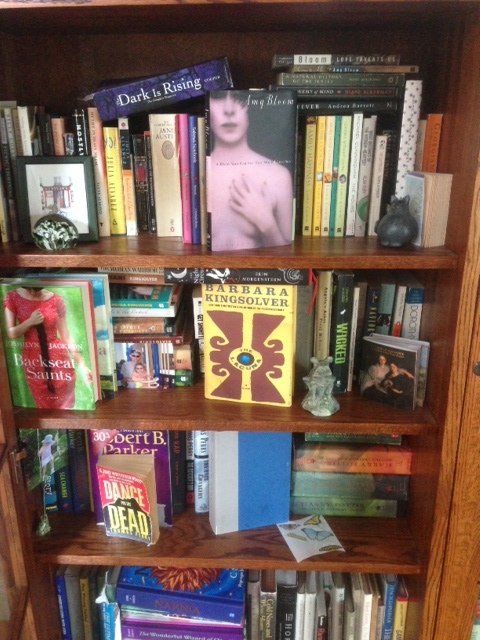 In my office, I keep reference books, books on writing, and a few copies of my own novel, one of which is in German. (I can’t read German but I like just to look at it sometimes.) Upstairs, are three bookcases — two for the kids, packed to overflowing, and one that I can remember standing in my great-uncle’s hallway. That one is filled with a motley collection — leather-bound books I inherited from him and will never read, travel guides, novels and textbooks from classes I took. Dignified books all. Who shares space on your shelves? Do they cohabit well, or are there some odd pairings? From poetry to pop-up books and everything in between. 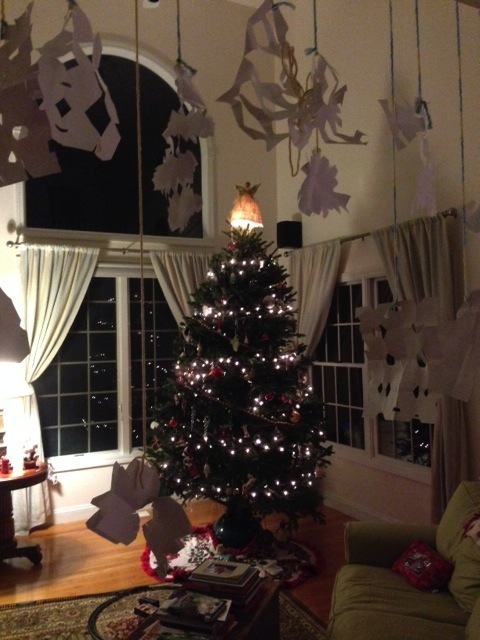 The tree is up, the outside of the house is decorated, and the holiday cards are in process. Every year, December seems to go by faster and faster — the month hasn’t even started yet and I already can feel the days slipping away. I want to pay attention to every single second this year. I want walks in the snow, nights curled up just gazing at the tree, meals eaten by glow of candlelight. I want carols on the stereo and lots of time just hanging out, reading or talking or playing board games. I’ll let you know how that plays out sometime in January, ok? Watch From Time to Time. It’s written and directed by Julian Fellowes, the selfsame fellow behind Downton, and you’ll recognize several of the faces. It’s a lovely, haunting story set at Christmastime during World War II. Invest in your inner writer (or the inner writer in someone you love). If you live in New England, consider giving a gift membership to Grub Street, or a workshop or class. It’s a great organization that truly helped me grow as a writer (and continues to do so). Which reminds me, I need to renew my own membership…. Summer and Bird, by Katherine Catmull. I loved, loved, loved this fairy-tale esque story so much that I might have captured it from the local library several times in a row. I’m planning on purchasing it so it can live on my shelves without guilt. 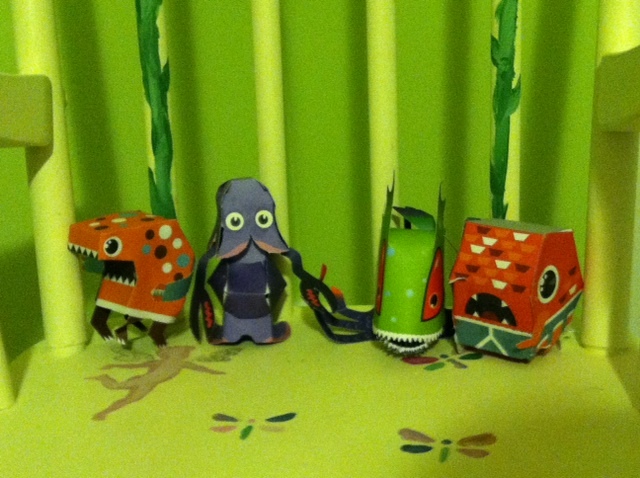 Our paper monster family. Aren’t they cute? A cross between origami and cartoon art, the book has over 50 teensy monsters, each with its own backstory, to be pressed out and glued or folded together. Both my kids love making them, and I may have created a few on my own when they were asleep one night. I’m not confessing. What’s on your holiday list this year? A very bright kid I know likes to share what he calls the “irrelevant statement of the day” every time I see him. I’m stealing the phrase and using it here, because this blog post is a digression. Today I’m not talking about writing or kids — I’m talking about killer whales. Okay, it’s not TOTALLY irrelevant. There is a book involved — Death at Sea World, by David Kirby. I am obsessed with this book. I have read it twice in the past month. It is a history of killer whales in captivity, specifically at Sea World. It looks at whether keeping giant-sized, intelligent, highly social animals in the equivalent of bathtubs is humane or crazy-making, and it details not just the attack that killed trainer Dawn Brancheau, but also a host of other, lesser known incidents, some of which also resulted in death. Here’s why I’m fascinated. For over half my life I’ve been around big animals. Not orca big, true, but the Slobbering Beast is the first pet I’ve had in 13 years that didn’t top out at over 100 pounds. I’ve trained big dogs, shown them, loved them, and been concussed by them. And that’s just the dogs. I’ve also had horses. And since I wasn’t gifted with a million dollar trust fund, I learned about horses the way lots of young women do — by saddling up whatever I could afford. That included a mare that fell asleep on me in the cross-ties and nearly broke my back, another that liked to jump paddock fences in the middle of a lesson and gallop the hills, a former stallion who tried to mount any mare that stood still on a trail ride, and a gelding who, when he wasn’t kicking you across stalls, was doing a credible imitation of a bucking bronco. Not only would he throw you, you had to ride with someone else on the ground at all times because once he got you off, he came back around to finish the job. I rode like this because I was young, foolish, and loved what I was doing. At yet, aside from a few truly bone-headed choices I’d prefer not to share, I have always, always kept in mind that these animals were exactly that — animals. I wore a helmet and sometimes a safety vest. I carried a crop and used a bit. Because much as I loved every horse, my instructor had taught me there would be days when he or she would not want to do what I was asking, that it would go against the animal’s personality , its nature, or simply its mood. And that my safety could depend upon my being prepared for that refusal. I teach my kids the same thing — to love animals, but to respect their nature. Much as you love the Slobbering Beast, remember he is a beast. Don’t stick your face too close to his, don’t put your hand in his mouth, don’t put yourselves in a position where your safety depends on trusting him to do the right thing. Because the right thing to you and the right thing to him may be completely different. These trainers — the people who got in the water with the orcas — were also often young and deeply in love with the animals and what they were doing. But they don’t call orcas “fluffy bunny whales” — they call them killer whales. Whether the name is a misnomer or not, the fact remains that — unlike domesticated dogs and horses — these are wild animals. They do not share our history, and they do not share our element. And that is why although I am awed by the courage of the trainers who entered the water with orcas, I am also flabbergasted by the hubris that made people think we could control the outcome. In Kirby’s book, in case of an attack the orcas are trained to return to the side of the pool when a trainer slaps the water with her hand or sounds a specific underwater tone. I once held the number nine spot in the entire country for obedience in my breed (my father used to like to point out that probably only nine competed). I’m a decent trainer. 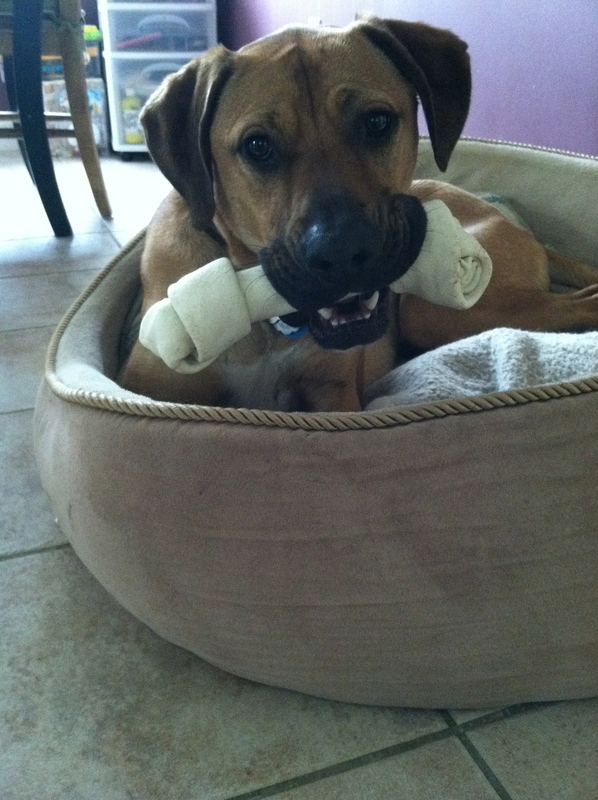 And yet I can’t guarantee a reliable recall on the Slobbering Beast a hundred percent of the time. Would I trust my life — or my children’s lives — on my ability to call him to heel when he’s chasing a squirrel or removing the drain pipes from the house? Not bloody likely. And yet that was the extent of the orca trainer’s arsenal in an emergency — the simple hope that this wild, intelligent animal would always do what it was being asked to do. Apparently OSHA agrees that hope alone doesn’t create a safe working environment. In OSHA versus Sea World, the government agency ruled that a slew of safety measures would be required for future trainer/orca work. I think orcas are beautiful. By all accounts, they sound intelligent and social. But after seeing videos like this, would I want to get in the water with one? I am behind today. There are many reasons, including the holiday weekend (in the US Monday was Columbus Day) and the fact that someone was Put Out about having to run in almost rain conditions. Can you tell? The Slobbering Beast does not care for damp. Instead of rocketing along at near-heart attack pace, we took a more leisurely approach today. Which was wonderful for my lungs, but not so great for time management. So I am asking you to go and play with these links, and I’ll be back next week with a real post. What does your brain look like on Jane Austen? NPR finds out. Can changing your genre change your career? Newly repped author Kell Andrews thinks so.